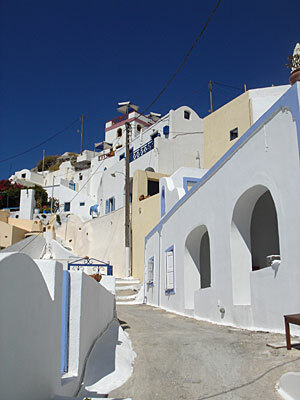 The small village of Imerovigli is perched perilously high on the edge of a high crater, with twisting alleys linking the houses. Imerovigli was almost totally destroyed in the earthquake of 1956, and the cliff-edge houses were abandoned but a tourist trade started up again in the 1970s. It's now one of the most expensive areas in Greece for accommodation!